Whether it’s the forests, mountains, coastline, rivers or high desert, living close to nature is one of the reasons we love Oregon so much. Sometimes our busy lives keep us from experiencing the beautiful place where we live. That’s why we recommend getting out your calendar and scheduling Saturday, June 9, 2018, for Get Outdoors Oregon Day, so you remember to take time to reacquaint yourself with nature. Get Outdoors Oregon Day is a statewide effort led by the Coalition of Oregon Land Trusts to encourage Oregonians to explore, discover and learn about Oregon’s special places and invigorate a movement of people to more regularly connect with the outdoors. 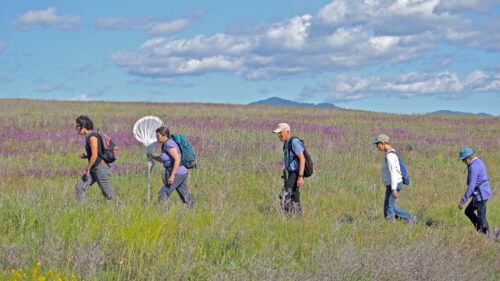 It is held in conjunction with National Get Outdoors Day and Oregon Get Outdoors Week, June 2 through 9. For this year’s Get Outdoors Day, the McKenzie River Trust invites the public to explore Green Island, an incredible natural area, with guided walks and activities. 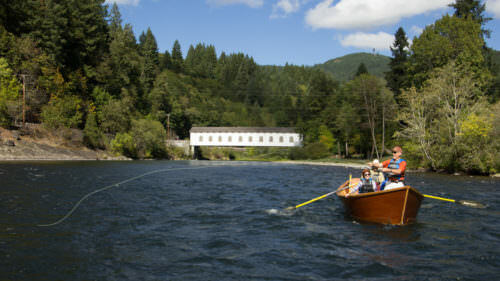 Go fishing in a historic river channel. Learn how to cast a fly rod with The Damsel Flies, a local women’s fly-fishing group. Learn about native fish through interactive displays with the Oregon Department of Fish and Wildlife and other conservation partners. Practice Qigong with an expert by the river banks. Bring a mountain bike and explore the area on two wheels, or leave the transportation to us with Eugene Pedicabs and tractor hay rides on site. Eat to your heart’s desire with local food carts serving up dishes. The McKenzie River Trust is here to tell you about Get Outdoors Oregon Day and the important role land trusts play in helping to ensure the quality of life Oregonians treasure. However you choose to celebrate Get Outdoors Day, use the hashtag #GetOutdoorsOR to share your photos, videos, and stories online! Land trusts are not-for-profit organizations that help people protect and care for the places they cherish: farms, forests, rivers, lakes, parks, trails, historic and sacred sites — you name it! What is Get Outdoors Oregon Day? What part do land trusts play? Get Outdoors Day is a nationwide celebration of all the good that comes from being outside: exercise, exploring, observing. Simply being in the natural world does wonders for our physical, mental and spiritual health. We’re plugged in electronically 24/7 these days, so much so that we may not even be aware of the seasonal changes going on all around us. Land trusts can help people reconnect with that childhood joy of being outside, exploring what is just around the next bend, or what you can see from that next branch. Land trusts provide places where people can focus on the here and now of nature. 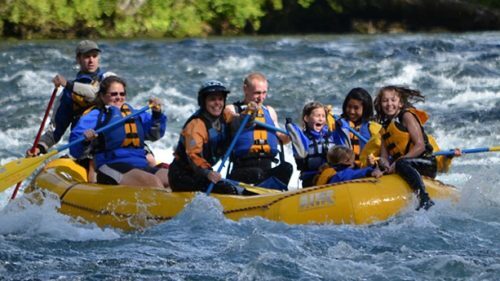 How does the work of the McKenzie River Trust fit in to Get Outdoors Oregon Day? 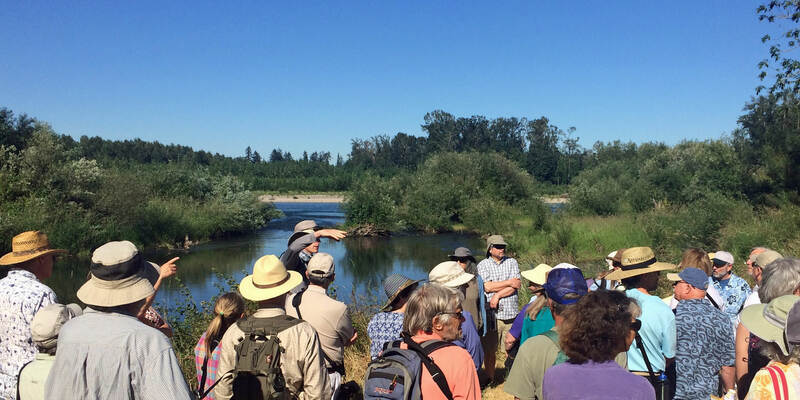 For years we have had an annual celebration at our Green Island property, west of Coburg near where the McKenzie and Willamette Rivers come together. We offer guided naturalist walks throughout the day. We also welcome people to simply explore on their own. They can check out the areas where volunteers have planted trees for the last decade, the forests that are emerging there. Or they can head out to the river and see how gravel bars shifted over the winter and what animals left their tracks in the sand along the banks. It is fun to then think of people enjoying similar ramblings all around the state and all around the country on Get Outdoors Day. What makes the McKenzie River special? We are incredibly fortunate to have the McKenzie River as our home. The crystal-clear headwaters are stunning. (And cold!) It will be great to celebrate this year’s 50th anniversary of the Wild and Scenic River designation. The river is rich with aquatic life. It is a lifeblood for our community and a fundamental reason people choose to live here. How does the McKenzie River Trust help make sure it stays that way? Landowners along the river are proud to be good stewards. The McKenzie River Trust is fortunate to be able to help ensure that. We’ve had good opportunities to acquire and manage places like Green Island and Finn Rock Reach, where people will be able to learn about, help take care of, and enjoy the river for years to come. If I care about the McKenzie, how can I help? Our Get Outdoors Day event at Green Island is free and open to the public, thanks to generous sponsorships from local businesses Terra Tech, So Delicious Dairy Free, and others. I hope many people will join us. More details about the event and about the McKenzie River Trust are available on our website mckenzieriver.org, or people can call us at 541-345-2799. Beyond Get Outdoors Day there are many ways to plug in to the work of the Trust. 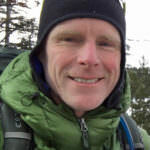 Joe Moll is the executive director for McKenzie River Trust, based in Eugene. Joe came to the Trust in January 2005 after working mostly with grizzly bears and landowners in Montana and Hokkaido, Japan. Outside of his work with Trust, he likes to spend as much time as he can running trails and exploring new places outdoors with his wife and three boys.